This is the third in an occasional series about the birth of Notion. Dave Racicot knew it wouldn’t be all rainbows and butterflies when he opened the doors to Notion, his 38-seat restaurant in Oakmont, a little more than two months ago. And not just because as executive chef and owner, the buck starts and stops with him. Cooking for 50 or more diners a day is challenging enough when it’s prepped, prepared and delivered by a staff you almost can count on one hand. But when the menu is as labor intensive as Mr. Racicot’s? There’s a reason he’s guzzling French press coffee out of a plastic Chinese takeout container at 2 in the afternoon. Once he gets up from the table, he’s not going to sit down again for at least another 12 hours. Each of the chef’s dozen dishes must be intricately plated with the steady hand and creative eye of an artist, and the garnishes — all integral to the dish, not just eye candy — often have as many components as the main parts of the dish. Here, for instance, is what goes into a cauliflower dish he dreamed up last week: roasted cauliflower, of course as well as cauliflower puree, brown butter pebbles, honey Dijon custard, pickled mustard seeds, one-hour egg, red grapes, vanilla aioli, lobster glace, lobster tail, dill and roasted panko bread crumbs. As photographer Jason Snyder’s images demonstrate on Notion’s website, the food is as playful as it is beautiful and inventive. Many find it so darn creative, in fact, that dinner at Notion is much more than a meal. “It’s what I intended on doing with food,” says Chef Racicot during an afternoon break on Feb. 11, a little more than a month into his life as a restaurateur. In a few hours, the ruby-red dining room will spring to life with wine glasses clinking and people talking and Smashing Pumpkins jamming on the sound system. What he didn’t expect was for Notion to so quickly become a destination restaurant. 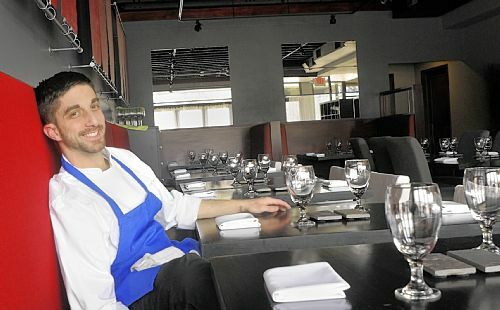 The goal when he set out a year ago, after working for several years at Nemacolin Woodland Resort’s flagship restaurant Lautrec, was to create a place where people could get the incredible modern food and top-notch service that earned him several James Beard nominations, but in a non-fussy environment. Week nights have been particularly slow, sometimes with only a handful of diners. Mr. Racicot optimistically chalks it up to the weather, and the lull that typically follows the holidays. There also isn’t as great a call for the $75 seven-course chef’s tasting menu as he’d like, with most people ordering a la carte off the menu. That said, the restaurant is busy enough on Saturday nights that manager Jennifer Jin quite often has to wait-list people calling for reservations. Other would-be diners are turned away at the door. But hey, at least they’re drinking more wine and cocktails than expected while they sit, and many of his guests are repeat customers, something he takes as a sign he’s doing things right. He’s also finding he doesn’t hate an open kitchen as much as he thought he would. “It allows guests a personal connection,” he says. “People make a bee-line for him at the door,” says Ms. Jin. Celebrity must make up for a lack of sleep because the 31-year-old father of three looks far more rested than he did in the lead-up to opening night on New Year’s Eve, with a neatly trimmed beard and relaxed smile. And he obviously must find an occasional minute to play, as evidenced by the cool new tattoo on his left wrist: “notion” in Courier typeface. “Quality versus quantity. Just one of the many challenges of a chef,” he noted on Facebook on Jan. 24. Another weekend in February, pastry chef Joshua Lind was off doing drills with the Army National Guard. But it’s his stress, which frees him up to have more fun. “If we don’t fill the water glass just so, or pull the chair out far enough, or drop something on the floor, it’s OK,” says Ms. Jin. The numbers aren’t yet where he’d like them, but Notion already is generating a buzz. 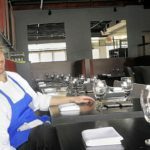 On Feb. 18, Chef Racicot was named a semi-finalist by the James Beard Foundation in its annual national awards in the Best Chef Mid-Atlantic category. Five finalists in that and each of the 18 other restaurant and chef categories will be announced March 21, with the winner bringing home the bacon at the annual awards ceremony and gala reception on May 9 at Lincoln Center’s Avery Fisher Hall in New York City. The same day, he was invited to cook, for the second time in as many years, at the famed Beard House. He’d love to take them up on it, of course. But without investors to pick up the tab, the experience could end up costing the cash-strapped chef thousands of dollars — money he needs to immediately put back into the restaurant to assure its success. Some might wonder how a chef who was in business for only one day — opening night on Dec. 31 — and not yet reviewed could find himself on Beard’s list. Characteristically, Mr. Racicot let the criticism roll off his shoulders. A nod from James Beard, he continues, won’t keep his doors open; the only way to accomplish that is to consistently make money. Notion is generating a pretty decent buzz, but a nice review on Urban Spoon only gets you so far, says Chef Racicot. So this spring he’ll advertise in local magazines and he’s also joining Open Table to boost the restaurant’s presence on the Internet. The place also is reaching out to wine lovers with classes, offering Saturday wine tastings from 3 to 4 p.m. ($40) with sommelier Alan Uchrinscko. Mr. Racicot also is toying with the idea of an “evolutionary” tasting menu that would feature upwards of 20 courses paired with even fancier, more exclusive wines that are currently out of the question — say, a high-quality white Burgundy. Private chefs dinners are another possibility. But that’s jumping the gun. The immediate challenge is getting people in during the week, and making them realize Notion isn’t just for special occasions. “So far, it’s so much better than I thought,” he says. 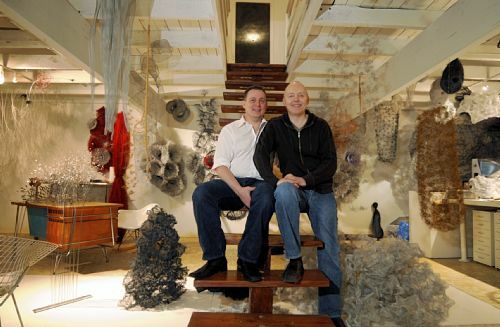 Garry Pyles and Atticus Adams, both conceptual sculptors, are two very creative souls. So you’d expect the home they share in Lawrenceville and use as studio space to also be a bona fide original. It’s not only their art that intrigues. Only when you’re inside do you realize that their home actually spans two adjoining buildings. They live mostly on the upper floors and rent out a one-bedroom, 2,000-square-foot space on the first. The exterior is so unusual that judges for this year’s fifth annual Renovation Inspiration contest, co-sponsored by the Post-Gazette and Community Design Center of Pittsburgh, quickly dubbed it a must-see. The former machine shop on the left still wears its original 1954 brick, while the balloon-frame 1890s grocery on the right, in a playful nod to Lawrenceville’s industrial past, is faced in corrugated galvanized steel. But what really earned the home the title of runner-up, large project category (more than $50,000), is the 6,000-square-foot interior. A celebration of light and air, with long, exposed beams and ductwork, the loft-style home is a modern artist’s dream: big, but not gigantic, with lovely bones just aching to be revealed. The work it took to get there? Well, not so dreamy. 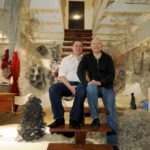 When the artists purchased the two buildings four years ago for $150,000, they were jam-packed with so much … stuff that the pair had a winding path of only about 18 inches to get around. Scrap metal, old store fixtures, work benches, framing lumber, metal shelving, machinery — you name it, the former owner had collected it and stacked it from floor to the ceiling. It took the men a year and a half to empty the space. More than 100,000 pounds of scrap metal went to a recycling facility, and they also filled an entire Dumpster with screws and bolts. Other items ended up on Craigslist. Some improvements, including the rubber roof, are brand-new or second-hand discoveries from Construction Junction (doors and windows) or Craigs­list (the mid-century cherry-red fireplace in the corner). Many more are creative repurposings of items and materials they uncovered during the clean-up. A 20-foot-long work bench, for instance, was refashioned into kitchen cabinets; metal shelving they discovered in the rafters was turned into open storage units with all-thread bolts and washers hung from the joists; teak paneling from a steel company’s boardroom decorates a wall in the foyer and was used to build a small deck off the kitchen. 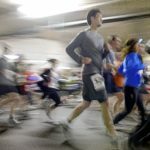 They also built a pavilion in the living room from old 2-by-4s and laid a floor of 2-by-6-foot pieces of hickory that came out of a steel mill in Follansbee, W.Va.
“The hard part was going through everything and figuring out what to keep. 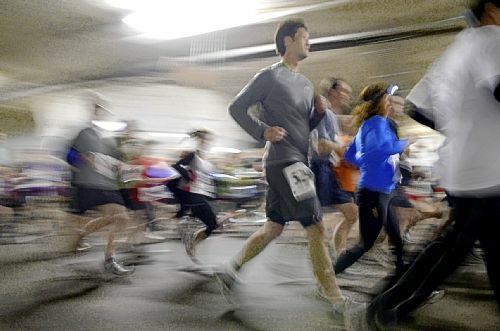 It was mind numbing,” says Mr. Pyles, 47. One no-brainer was the 31/2-by-9-foot kitchen island, which the previous owner made from maple salvaged from a bowling alley. You can still see the pin holes in the corners. Another was the six-burner Imperial commercial range hidden under piles of junk. There were other issues, too: When Mr. Pyles put the house he owned on Butler Street on the market, it sold in just six days, leaving him and his three sons with no place to live during the renovation. They ended up renting a house with only a basement toilet and no central heat during the five months of construction. “We were really roughing it,” he says. An interior designer who’s a vice president at Franklin Interiors in the Strip District, Mr. Pyles is an old hand at ambitious renovations, having transformed five buildings into homes over the past 25 years. This would be a bit more challenging in that they were determined to keep costs around $50 per square foot, which also explains why the men were so eager to reuse as much of the buildings’ booty. They even sweet-talked sculptor Dee Briggs, who works in bronze and steel, into bartering her services. “We really love her work, so we traded it for materials,” Mr. Pyles explains. Her suspended metal sculpture hangs next to one of Mr. Adam’s 3-D metal fiber creations in the kitchen. Financing proved to be a bit of problem, as it was tough to get lenders to understand the project and how someone could live in an industrial space. Even today, says Mr. Adams, people want to put in applications for the restaurant they thought the men were going to build. “We did a lot of explaining,” he says. Visual artists need plenty of space to create, so when designing their studio in what had been the second floor of the grocery, they had Lawrenceville contractor The Christie Group remove a walled staircase to the attic and build a new one, without hand rails. The master bedroom, which adjoins a private bath with concrete floors, is on the first level, off the front door. A second bedroom at the rear of the house, used by Mr. Pyles’ youngest son, has a ladder to a sleeping loft. The home is intentionally unpolished, with some of the repurposed materials begging for a good coat of decorative makeup or perhaps even a wall to keep things out of sight. The water heater, usually a hidden mechanical, stands out in the open in the pantry, and even the new ducting is exposed. But that suits its occupants just fine. “It’s so great being home now,” agrees Mr. Adams. “The light is fantastic, and it’s a great space to entertain. I just feel so satisfied, like I never need anything else.